Plunging prices of whole and half pork loins have meant lots of pork on my table. I have seen the uncut boneless loins selling for as little as $1.65 a pound this month. Who could resist tossing a couple in the cart? Well, lots of people. Specifically, those who are stumped about what to do with such a large hunk of meat. I’m here to help. I have been buying whole boneless loins for several years, so I know a thing or two about big hunks of pork. Pork loins — basically, the meaty part of a pork chop — are very lean, so they should be cooked quickly or long and slowly. If you stop somewhere in the middle — say, 30 minutes for a chop — the meat will be chewy and dry. So what do I do with all this meat? First I turn about half of the loin into boneless pork chops, slicing it 1- to 1 1/2-inches thick. I wrap the chops individually, then stash them in a gallon-size freezer bag in the freezer. I pull out three at a time to grill or pan-fry. Sometimes I bread them, but not usually. I season the chops with salt and pepper and brown them over medium-high heat for about 2 minutes on each side, then finish them in a 350-degree oven. Ten to 20 minutes, depending on thickness, will do it. Check the temperature by inserting an instant-read thermometer horizontally into the chop. It should read 145 degrees for pink or 155 degrees for cooked through but still juicy. Some of the remaining meat is cut into strips for stir fry or cubes for fricassee or Tony’s beloved Japanese curry. I portion the stir-fry strips into small zipper-lock freezer bags, add about a tablespoon of soy sauce and squish it around to coat the meat before freezing. It’s instant marinade. The rest I use as roasts — one or two, usually. I might cook one in a slow cooker with criollo mojo marinade for Cuban roast pork or in a Dutch oven on the range with Asian seasonings. Or, I’ll stuff it and roast it as I did last fall with a cornbread-apple stuffing. I haven’t plain roasted a pork loin for a long time, but I did on Sunday after I found a recipe for Rosemary Roast Loin of Pork. The pork loin roast is stabbed on each end with the blade of a sharp knife, and a sprig of rosemary is inserted deep into each slit. As the meat heats and cooks, the rosemary flavors the entire roast. Part way through cooking, Pinot Grigio or another fruity white wine is added with water to the roasting pan. When my roast was done, I cut it into thick, glistening slices and spooned the luscious pan juices over them. Tony and I ate just half of our 2 pound roast, so we have plenty of leftovers this week for his ramen and my protein snacks. Wells calls for a 5-pound roast, which is too gigantic for Tony and me. Use your own judgement. I also replaced Wells’ fresh rosemary with sprigs of dried from the bush that died in my mud room while I was in Florida. I soaked the prickly sprigs in hot water until pliable, and they scented the roast beautifully. I don’t have a rack small enough to fit into a pan that’s a sensible size for a 2-pound roast, so I crisscrossed the bottom of the pan with chopsticks and wooden skewers. My makeshift rack kept the roast off the bottom of the pan, while allowing some of the pan juices to gently lap it. The flavor of this roast was out of proportion to the scant amount of ingredients and work required. The recipe is a keeper. Preheat oven to 400 degrees. Pat the roast dry with paper towels. With the point of a slender, sharp knife, pierce the centers of both ends of the roast and insert a sprig of rosemary in each slit. Season the roast generously with salt and pepper. Place fat side up on a roasting rack in a roasting pan. Place in the center of the oven and roast until the skin is crackling and brown and the meat begins to exude fat and juices, about 30 minutes. Reduce the heat to 325 degrees and base with any juices from the pan. Add about 1/2 cup wine and 1/2 cup water to the pan. Continue to add wine and water as needed, to maintain a thin layer of liquid in the pan at all times, and baste at 20-minute intervals. Roast the pork for about 25 minutes per pound for a bone-in roast or 15 minutes per pound for boneless, for slightly pink meat, or 20 minutes per pound for juicy but cooked- through. An instant-read thermometer should register about 145 degrees for pink and 155 degrees for cooked through. Let stand for 15 minutes — no longer — before cutting into thick slices. Meanwhile skim the fat from the pan juices and simmer over moderate heat, scraping browned bits from the bottom of the pan. If necessary, add several tablespoons of cold water to deglaze the pan, and bring to a boil. Cook, scraping and stirring, until the liquid is almost caramelized, 2 to 3 minutes. Do not burn. Spoon off any fat. Pour into a sauce boat and pass at the table. A 2-pound boneless roast will serve 6 generously. I would go to the ends of the earth to taste a new cuisine. Luckily, I didn’t have to; It came to me. Those who have yearned to taste Uzbek food — as in Uzbekistan, Tashkent, the Silk Road — now can satisfy their curiosity at a store-front carryout in Cuyahoga Falls. Two high-top tables hug the front wall of the public space, leaving just enough room for a person to reach the order counter. It was staffed by a precocious pre-teen boy when I visited. He relayed my order to the kitchen, which is shielded from the customers by a drape. The eight-item menu is on the wall with pictures, Uzbek names (in the Roman alphabet, not Cyrillic) and English explanations. The prices are ridiculously low. You could order the entire menu for $38. There’s Uzbek’s national dish, “Plov” — chunks of beef with rice and carrots, $7 — and the Uzbek snack, “Cheburek” — a deep-fried meat or potato turnover, just $2. I ordered the “Manti” (steamed beef-stuffed dumplings with unusual spices), $6, and a “Somsa” ($2), which looks and kind of tastes like a Lebanese meat turnover, with a lighter pastry and different seasonings. I wish I had picked up some Uzbek flat bread rounds, too. Next time. Uzbek Cuisine is at 2457 State Road., next to the Falls Wheel & Wrench Bike Shop, in Cuyahoga Falls. The phone is 234-706-6664. The sign outside says “Authentic Middle Eastern Food,” but who are they kidding? The exotic food is from deep in Central Asia, and this little carryout may be your one chance to taste it. Regarding your post on wanting to grow bay laurel, Donzell’s in Akron stocks them in the greenhouse section where they sell the herbs, but they don’t stock many herbs until around Memorial Day. I debated whether to share this juicy tip, but my better self won. I will be first in line. Thanks, Cheryl. I saw a recipe for your Sichuan dumplings in chili oil, and the missing ingredient may be Chinkiang black vinegar. Good luck. Possibly. I plan to buy some on my next Chinese-store run. I’ve been watching a lot of cooking shows on Public Television’s Create TV — one of the blessings of retirement. Given that the quality of ingredients logically ought to be a big factor in the results of your cooking efforts, how do you feel about using Louisiana gulf shrimp as opposed to shrimp imported from elsewhere? There was a lot of talk on one of the shows about the superior flavor and texture of Gulf shrimp. What’s your thinking on sourcing seafood? Hands down, wild shrimp from the Gulf of Mexico is superior to all other shrimp I’ve tasted. I once compared Gulf and Asian shrimp in a taste test. No contest. Most of the shrimp sold in local stores is farmed, which I use sometimes because of the lower prices. It doesn’t have a lot of flavor, though, and the texture isn’t as firm as that of Gulf shrimp. Yes, the source of seafood matters. So does how the seafood is handled after it is caught. The first thing to look for is wild-caught. Then, if you have access to the information, buy seafood that is frozen right on the boat. For scallops, “dry pack” is a useful descriptor. For fish, “line caught” is the ecologically sound way to go. The clerk behind the fish counter should be able to give you this information. Ideally, patronize a store that knows the provenance of its products, has a high turnover and handles the seafood carefully. I have not yet tried the Taiwanese pork belly buns or the honey-bacon shrimp with crushed peanuts. But I have tasted the spicy chili pork wontons in a citron sesame chili sauce, and that appetizer alone is enough to keep me coming back to House of Hunan in Fairlawn. Some chefs get better with age, and that’s true of chef/owner Lawrence Suen, who keeps slipping luscious new items onto his list of seasonal specials. I loved the chili pork wontons so much that I had to have some the next day or I would burst, so I set about making them. “Don’t ask me what’s in them because I don’t know,” Suen’s wife, Cheryl, had told me after dinner, so I brought home a couple of tablespoons of leftover sauce from the restaurant. I would clone it. Easier said than done. The wonton dish, I learned, is actually an old Sichuan specialty. Why had I never heard of it? Maybe because the Akron area for decades was a Chinese-food wasteland, punctuated here and there with a few decent dishes from Chin’s and House of Hunan. And in my travels to larger cities, the spicy wontons had simply slipped through the cracks. At its most basic, the dish consists of wonton wrappers stuffed with a seasoned ground pork mixture, gently boiled for 5 minutes or so, drained and served in shallow bowls in pools of a fiery Sichuan sauce. I had no problem finding recipes, but I did have problems matching the exquisite flavor of Suen’s sauce. I could see sesame seeds, chopped garlic and finely diced green onion tops in his oily red broth. But what contributed that deep umami flavor that tempered the fire of the Sichuan chili oil? I guessed sesame paste, available in Asian stores or as tamari in health-food stores and many regular supermarkets. I prepped the seasoned meat and the sauce a day in advance to allow the flavors to meld. Before dinner the next day, Tony helped me fill and fold the wontons in the shape of large tortellini. When the pasta was done and the meat filling cooked through, I drained the pouches and stirred one-third cup of the pasta water into the sauce. Yeow, was it spicy! It was delicious, too, although not nearly as good as House of Hunan’s. I will keep tinkering with the recipe and eating the results of my experiments, with the occasional trip to House of Hunan to check my progress. Maybe I’ll never get it right, but I’ll have a great time trying. I challenge you to try the dish at House of Hunan if you live in the area, then make my version at home and tell me what is missing. (The dish is surprisingly easy to prepare.) Together we can crack this mystery or, at the very least, have a couple of great meals. FYI, I stepped down the heat in my recipe. If you like very hot foods, add more chili oil to taste. In a small bowl combine all ingredients except the water. Mix very well to incorporate the sesame paste. Cover and refrigerate overnight. The next day, bring to room temperature. After the wontons are done, stir 1/3 cup of the cooking water into the chili sauce. Spoon sauce over the wontons in individual serving bowls. Combine pork, salt, sugar, onions, garlic, ginger and sherry. Mix well. If possible, refrigerate overnight to allow flavors to blend. The next day, bring to room temperature. Place a wonton wrapper on a work surface. Place a mounded teaspoon of the pork mixture in the center the wrapper. With your fingertip, brush the edges of the wrapper with some of the beaten egg white. Bring two opposite points together and firmly seal the edges of the wonton to form a triangle. At either end of the long side of the triangle, bring those two points together at the bottom of the filling bulge and press together. Don’t encircle the filling in the middle; encircle it at the bottom, so the filling bulges upward. The result should resemble a tortellini. Continue with remaining wonton wrappers and filling. You should have about 32. Bring at least 4 inches of water to a lazy boil in a wide pan. In batches, cook the wontons for 5 minutes, or until the pasta is done and the filling is no longer pink when you cut into a wonton. Remove with a long-handled strainer, transferring to shallow bowls. Place six wontons in each bowl for appetizers, or eight for entrees with steamed rice on the side. Stir one-third cup of the wonton cooking water into the chili sauce, and spoon it over the wontons. Garnish with toasted sesame seeds. Makes 5 appetizers or 4 entrees. Split pea and ham soup; meatloaf, baked Japanese sweet potatoes; Sichuan chili oil wontons. Cavatelli with meat sauce, crisp salad, Massoli’s bread at Dontino’s La Vita Gardens in Akron; a Jane Roll from Sushi Katsu in Akron; an egg roll, pork wontons in a spicy Sichuan chili oil sauce, and cold Singapore noodles with apples, cucumbers and steamed shrimp from House of Hunan in Fairlawn; a soulful lima bean and ham soup, clam and corn chowder and African peanut soup at a VFW Auxiliary soup fund-raiser in the Highland Square area of Akron. Here’s another recipe I developed for a book on microwave desserts. I found that bread pudding is a natural in the microwave. I experimented with different breads such as croissants, brioche and French but found plain supermarket white bread works best when the cooking time is short, as it is in a microwave. In the following recipe, I paired acidic pineapple with sweet, soothing custard and tossed in pecan pieces for crunch. If you have time, toast the pecans in a dry skillet to amp up the flavor. Remember that the size and composition of the mug (I used a 12-oz. Fiesta pottery mug) will affect cooking time. Place butter in a 12-ounce pottery mug and microwave on high power until melted, about 20 seconds. Add milk, pineapple, egg white, vanilla and salt and beat with a fork until egg white is thoroughly incorporated. Add bread cubes and pecan pieces and press into the milk mixture, folding to distribute pecans evenly. Microwave on 50 percent power for 2 minutes, 30 seconds in a 1000-watt oven, or 2 minutes in a 1100- or 1200-watt oven, adjusting time up or down for lower- or higher-watt ovens. The pudding is done when the top is set but still moist, and the sides of the pudding look set when a knife is inserted between the pudding and mug. Eat from the mug or, if desired, let stand 2 minutes, loosen edges with a knife and invert onto a plate. Enjoy warm or at room temperature. Dress it up: Toast the pecan pieces in a dry skillet before folding into the pudding. Even better: Sprinkle the warm pudding with 1/2 teaspoon dark rum and top with whipped cream and a pecan half. The next time you and Tony head up to Cleveland, you can get your Cuban sandwich fix at Sabor Miami Cafe and Gallery on Broadview Road in Cleveland. The Facebook and Yelp reviews are excellent (I’ll have to try it myself). Cheers! I had no idea! I see that the little restaurant opened in another location, refined its menu and moved last year to its current location at 4848 Broadview Rd. in the Old Brooklyn area of Cleveland. The owner is Honduran native Mariela Paz. She serves an eclectic menu of Cuban and Latin American dishes and breakfast comfort foods. The restaurant is open for breakfast and lunch only. The phone is 440-714-0202 or you can find Sabor Miami Cafe on Facebook. I’ll report back after I try the Cuban sandwich, which will be soon. Thanks, Mary. I’m back home in the cold and snow, watching the Olympics and warming myself with thoughts of all the great food I had in Florida. Yes, I ate too many Happy Meals in pursuit of wifi (Hurricane Irma destroyed our campground’s system). And I ate at places like Domino’s (yuk) and Golden Corral (not bad) because marriage is compromise. But I also had a lot of fine seafood and catered to my Cuban food obsession. Here are some highlights. Best deal: Three pounds of just-harvested large stone crab claws for a measly $30 at a gas station in Everglades City. The charming little town is the self-described “World stone crab capital.” There’s so much crab that it’s even sold at gas stations. We missed the town’s seafood festival by one day, but had a festival of our own after toting the crab back to Okeechobee in a $7 Styrofoam cooler. Best Cuban sandwich: Not Mervyn’s in Ft. Pierce, which somewhere along the line won the local title. Its Cubans are good but not great because they include salami and are relatively small. I want a sandwich with heft. I want to get two meals out of one. The foot-long Cubans from El Cubanito’s in Ft. Pierce were just about perfect – crisp pressed Cuban bread, plenty of marinated roast pork, the traditional mustard and dill pickle chips along with ham and melted cheese. But the sandwich from Vicky Bakery in suburban Miami had all of that and a hint of creamy mayo, too. Later I made a clone that Tony said was even better that Vicky’s, but I doubt it. Here in the frozen North, I’m already planning to buy a pork roast and start making Cuban bread. I miss those sandwiches. What I learned: Yuca is cassava is manioc. Same tuber, different names. I already knew the difference between yuca, a starchy vegetable that is eaten widely in the Caribbean, and yucca, an ornamental shrub. Before frying some up (or boiling, roasting or steaming it), you should know the difference, too. Gator is still chewy, dammit. Tony, who claims he has cooked and served alligator steaks in his sushi bar, also claims that the alligator he got at festivals and in restaurants in Florida was tender and juicy. I say it was as dry and chewy as all the other alligator I’ve eaten over the years in the line of work. I was happy, though, that Tony limited his alligator obsession to eating it. All month he wondered aloud whether a license was needed to hunt them. I finally realized he was serious. How would he kill one? Grab it and choke it, he said. What would he do with the carcass? Eat the tail and mount the head to hang on the wall, he said. Lord help us. Shrimp Tortuga at a casual beach restaurant, the Cottage, in Ft. Myers. Friends took us to the place, where we ate outdoors on a deck overlooking the ocean. The shrimp I ordered came with crusty bread to dip in the luscious sauce that was a flavor bomb of butter, garlic and lemon. Intense garlic and lemon. A friend and I couldn’t stop sopping up that sauce. I tried to duplicate the dish back at the campground. I made a silky beurre blanc with wine, butter, lemon juice, garlic and a dash of hot sauce. It was delicious but not shrimp Tortuga. I tried again after I came home, and this time I got it right. The sauce is merely melted butter with lots of chopped garlic, lots of hot sauce and a dash of cream. Instead of lemon juice, I used grated lemon rind for a more intense lemon flavor. Bingo. Melt 2 tablespoons of the butter in a medium skillet over medium-low heat. Add garlic and cook until softened but not starting to brown. Stir in hot pepper sauce. Increase heat to medium and sauté shrimp, stirring once or twice, just until no longer opaque. Remove shrimp from skillet and set aside. Increase heat to medium-high and add wine. Simmer until reduced slightly. Stir in cream and remaining 6 tablespoons butter. Stir in lemon zest and cook for one minute. Taste sauce and add more hot sauce if desired. Return shrimp to pan and bathe in sauce. Divide among 2 to 4 plates and top with cilantro. Makes 2 to 4 servings. 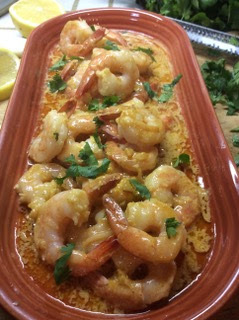 Shrimp with garlic, butter, lemon and hot sauce. Pulled pork, smoked brisket, cornbread stuffing, mashed potatoes and a yeast roll at Golden Corral; fried hog snapper, french fries and coleslaw at Triad Seafood in Everglades City, Fla.; Cuban sandwich, plantain chips and yuca fries from Mervin’s Cafe in Ft. Pierce, Fla.; a chicken sandwich from KFC near Jacksonville, Fla. pepperoni pizza from Rizzi’s in Copley, Ohio; a quinoa and kale broth bowl with chicken and an apple at Panera Bread in Montrose. The Akron Recipe Project, a book in the making from retired Akron librarian Judy James, needs your help. The book will be about what people in Akron have been cooking for their families for generations. It will also be about the stories behind the recipes. James is collecting the recipes and stories now, and hopes a few of you will share. The recipes need not be iconic Akron recipes – just recipes that are important to you and your families. Submit recipes to Judy James at akronrecipeproject@gmail.com or contact Judy at 330-815-0775. The best wedding soup I ever had was at Yocono’s on West Exchange Street in Akron. I also liked their individual casseroles of penne pasta, meatballs, marinara sauce and cheese baked in the oven. Has anyone found a close second for either dish? I am sorry I missed those dishes when the restaurant was in business. I know Vaccaro’s Trattoria in Bath had excellent wedding soup the last time I tasted it. Hopefully we will hear from others who have suggestions for you. Anyone? My husband has single-handedly stuffed our four (yes, four) freezers with an assortment of venison this season. I have made venison chili, venison spaghetti sauce, venison lasagna, a venison version of pasta a’ fagioli, and Johnny Marzetti with ground venison. Do you or Tony have any other venison recipes that I could surprise my husband with? Just about any ground beef recipe can be made with ground venison. I have made ground venison gravy over mashed potatoes, hamburger goulash and shepherd’s pie. I request Tony’s deer be butchered into ground meat and an abundance of roasts. I use the latter in spicy recipes – for example, I rub a roast with Mexican spices and cook it in a slow cooker, then shred it with forks and use it as a stuffing for burritos. Last year I also cubed a roast and turned into classic goulash, which I provided a recipe for (made with beef) in my newsletter. You can access it by clicking here. I am less inclined to cook venison steaks but when I do, I make a fruity wine sauce with the pan drippings to pour over the meat. Another good idea for venison steaks is to marinate them. This is a great time to try bulgogi, Korean marinated and grilled strips of meat. Use any venison steak and cut it into strips and marinate several hours or overnight. Grill (or pan grill) the strips and serve with rice at an Olympic-watching evening. This recipe was given to me years ago by Jong Mi Edinger of Hudson. I am also including her recipe for a spicy salad to round out the meal. Cut the meat across the grain into 1/8-inch-thick strips. Combine all remaining ingredients except the medium onion and head of garlic. Mix well and pour over meat strips. Cover and refrigerate one to two hours (or overnight if using venison). Meanwhile, cut onion in half lengthwise, then slice halves horizontally. Prepare a hot fire in a charcoal or gas grill, and cover grill with a fine-mesh screen. Remove meat from marinade and place on screen with sliced onion and whole garlic cloves. Grill until beef is cooked through but still moist. Serve with the onions and garlic cloves and, if desired, cooked white rice. Serves three to four. Wash and dry lettuce. Tear into bite-sized pieces and place in a bowl. In a small bowl, combine remaining ingredients. Pour over lettuce and toss. Serves four. 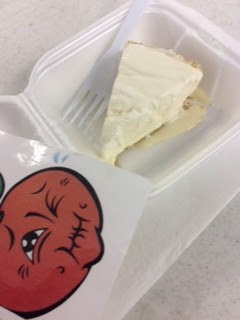 I didn’t get to taste the swamp cabbage but I did snag one of the last pieces of sour orange pie at the Lakeport, Fla., Sour Orange Festival last weekend. The shindig’s logo was an orange, making a puckery-angry face. How could I pass up such a unique food event just a 15-minute drive from our campground? Things were well underway when we parked in a tufted and rutted pasture with about 20 other vehicles. Apparently the festival was not a hot ticket beyond Lakeport, a sun-baked crossroads of 7,500 residents. A dozen or so knocked-together booths selling crafts, fried alligator, boiled swamp cabbage and the like were set up in a grove of live oaks. A trio played country-western music on a scuffed stage attached to the community building, where all the sour orange action took place. Dorri and her committee were on track to sell out of sour orange pie, as usual, though. In the weeks leading up to the festival the women juiced three 55-gallon drums of sour oranges picked from local trees, which grow wild in the area. The trees, brought here by Spanish colonizers, used to grow all over Florida. They were the root stock for Florida’s sweet-orange industry. Sour oranges are a staple of Cuban cooking and the cooking of Lakeport, where women turn the juice they squeeze into creamy frozen pies that taste like a Creme-sickle. Tony and I shared a slice and got the recipe from Dorri. Sour orange juice is hard to find outside Latin American and Mexican food stores. Half lime juice and half orange juice may be substituted. Dorri gave me a sour orange before I left. It tastes citrusy but not orange-like. It is pleasantly sour, not lemon or lime sour. I like the flavor and am sorry I won’t be able to find the fruit in stores. I’m even more sorry I won’t be around for the swamp cabbage festival in nearby Belle Glade later this month. I learned that what old Floridians call “swamp cabbage” is what we call “hearts of palm,” a gourmet item that costs a fortune when you can find it in cans. Combine milk, topping and juice and beat with an electric mixer until well blended. Pour over graham crusts. Place in freezer until very firm, preferably overnight. (Wrap with plastic after filling firms up.) Let pies soften slightly at room temperature before cutting into wedges. Makes 3 pies. Jane’s notes: * To make one pie, use 1 can milk, 2/3 tubs topping, 2/3 cup juice and 1 pie shell. * Just before serving, decorate pie(s) with whipped topping and orange slices if desired. Half of a bagel-egg sandwich from Dunkin’ Donuts; a fish sandwich (probably tilapia) with fries and coleslaw at the Tin Fish in Okeechobee, Fla.; boneless ribeye steak, baked potato and iceberg lettuce salad with blue cheese dressing at the Brahma Bull Restaurant near Okeechobee; a tower of marinated raw tuna, avocado chunks, diced cucumber, crab cream cheese and pickled ginger with salmon roe and wasabi cream and eel sauces at 12A Buoy in Ft. Pierce; sugar-free Dilly Bar from Dairy Queen; and a practically flavor-free ham and pineapple pizza from Domino’s (my first from the chain). Nothing. Tony, however, made delicious grilled hot dogs on top-sliced buns with mustard, chili, grilled hot peppers and chopped onions. Yum. Wanted to let you know that Siamone Fryer (Siamone’s in the Gala Plaza on Waterloo Road) has opened in her new location in the Brimfield Plaza. I was so glad to hear, and anxious to have her delicious Malay curry. That is good news. I like her food, too. The restaurant’s Facebook page, under Thai Monies, lists hours of 4 to 10 p.m. Tuesday through Saturday and noon to 5 p.m. Sunday at 4112 Brimfield Plaza, State Route 43, in Kent. Phone 1-330-474-7588.